The Australian company of Boori have been operating inside the UK since 2005, twelve years after their creation. They specialise entirely in children's furniture and offer a wider range of styles. Their mission is to provide households with durable and stylish furniture that will last throughout the childhood years and well into adulthood. Recently they have been developing Boori Changing Tables, which have proved to be popular with parents and children alike. All are beautifully crafted out of wood, and are made to look elegant. They will easily blend in with other furniture in the household, although there is the option of purchasing these changers as part of a set with a cot and a wardrobe. The changers are all open faced and all have three levels. On the top level, there is a wide space to put a changing mat which, when in place, will be surrounded by a wooden frame meaning the baby will be safe and secure, as it will be nigh on impossible for them to roll over and fall off. On the second two levels it is possible to store all materials relating to changing a baby and more. It is possible to keep heavier objects on the bottom level which is thicker, while the thinner middle level will be able to hold items such as nappies and toys so they are on hand for when the baby is being changed. The middle tray is also able to slide in and out for your convenience. Apart from the Sleigh Changer, the remaining changers all come equipped with wheels on the bottom, so the piece of furniture can be moved between rooms with ease, making it very convenient. What's more is the wheels are able to lock - or be removed if preferred - so the object won't move when the baby is being changed. It is possible to order these baby changers directly off Boori's UK website, or if you prefer, call the number written on the website to order over the phone. The process is very straightforward and you should receive your changer well within two weeks. Alternatively there are baby boutiques up and down the country which stock the Boori Changing Table. These boutiques can be found in most of the major cities and urban areas, so they are convenient to find. 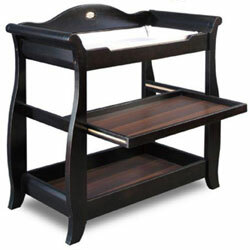 The stores will tend to deliver the changing tables to your home if it is not too far away. Customers should expect to assemble the changing table, and it will come with a manual on how to do this. Apart from the Sleigh Changer, which costs £299,99, the rest of the Boori baby changers cost £199.99. Bear in mind they can be converted into a simple piece of furniture when the baby outgrows them. They will always come with a one year warranty.